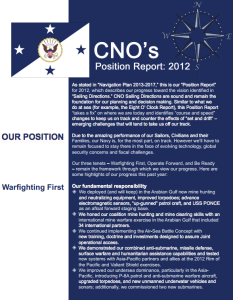 As stated in “Navigation Plan 2013-2017,” this is the CNO’s Position Report for 2012. It describes the U.S. Navy’s progress toward the vision identified in the CNO’s Sailing Directions. The CNO Sailing Directions are sound and remain the foundation for planning and decision making. Similar to what the USN does at sea (for example, the Eight O’ Clock Report), this Position Report “takes a fix” on where the Nay is today and identifies “course and speed” changes to keep it on track and counter the effects of “set and drift” – emerging challenges that will tend to take the USN off track. The main points are aligned with the CNO’s Tenets from his Sailing Directions. Warfighting First – We will develop strategies and capabilities to command the sea and project power. As described in our Air-Sea Battle Concept we will enhance enduring U.S. advantages and create new ones to overcome threats to our freedom of action and exploit our adversaries’ vulnerabilities. We will continue developing, fielding and integrating unmanned air vehicles into air wings including X-47B UCAS-D and UCLASS. We will sustain our undersea dominance by implementing a networked approach including aircraft, subs, off-board sensors, communications and unmanned vehicles. We will accelerate fielding of procedures and systems to make the electromagnetic spectrum and cyberspace a primary warfighting domain. With the other sea services we will revise our maritime strategy, “A Cooperative Strategy for 21st Century Seapower”, to address the challenges and threats facing us in the near future. We will develop concepts to guide future amphibious operations, building on the ongoing “Single Naval Battle” effort with the Marine Corps. We will describe “How We Fight” in detail with a book-length project to educate the force and guide future doctrine and operational concepts. Operate Forward – We will ensure the ability of our forces to sustainably operate forward at the maritime crossroads with relevant warfighting capability. We will deploy USS FREEDOM to Singapore in early 2013 and complete work to homeport the first two destroyers in Rota, Spain in 2014. We will station three additional patrol craft in Bahrain with rotating crews and permanently homeport in Bahrain the crews of four minesweepers, complemented by new minesweeping systems that expand their capability. Be Ready – We will continue to focus on the proficiency and confidence of today’s fleet with today’s systems and weapons, while addressing factors that detract from safety and readiness. We will monitor and sustain the “Health of the Force;” in particular we will restore tracking of individual operational tempo (ITEMPO) alongside other measurements. We will develop and implement strategies to attack sexual assault and suicide. We will raise the number of Sailors at sea and address fleet manning “fit” deficiencies in an enduring way. We have already seen movement on this position report with the deployment to the Western Pacific of the USS FREEDOM; much work remains in the area of sexual assault and suicide.